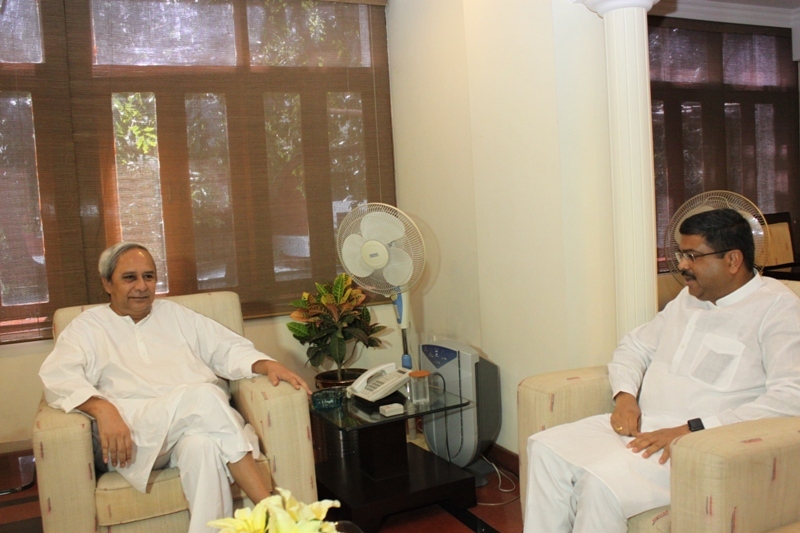 New Delhi: A meeting held between the Chief Minister of Odisha, Shri Naveen Patnaik, and Minister of State (Independent Charge) for Petroleum & Natural Gas, Shri Dharmendra Pradhan, here yesterday helped resolve the contentious issue of VAT deferment on products produced by Indian Oil Corporation’s Paradip Refinery in Odisha and sold in the State. Various options available to reach an amicable settlement of the tax dispute between IndianOil and the Government of Odisha were discussed at the meeting, which was also attended by Secretary, Ministry of Petroleum & Natural Gas; Chairman, IndianOil; Chief Secretary, Government of Odisha; and Development Commissioner, Odisha. In line with the Hon’ble Prime Minister, Shri Narendra Modi’s vision of providing adequate resources for the overall development and industrialisation of Eastern India, including Odisha, an amicable solution has been found to resolve the impasse. Keeping in view both the fiscal health of Odisha State and the commercial interests of IndianOil, the Government of Odisha has now agreed to extend the deferment of VAT on products produced by Paradip Refinery and sold in the State from 11 to 15 years but with a cap of Rs. 700 crore per year. Commenting on the same, Shri Dharmendra Pradhan complimented both the parties for agreeing on a middle path and a mutually acceptable solution. He said that the new arrangement will give a big boost to industrial growth in Odisha by reinforcing the faith of entrepreneurs in the State Government’s administrative mechanism. IndianOil’s investment of over Rs. 40,000 crore in Paradip Refinery and allied facilities is the single largest investment by a corporate in Odisha. Further investments are in the offing, including expansion of refining capacity, and downstream petrochemical options like Polypropylene, Mono Ethylene Glycol, Paraxylene, Petcoke gasification, etc., which will go a long way in the development of Odisha as a petrochemicals hub. Shri Pradhan urged the State Government to facilitate IndianOil’s expansion plans in order to create downstream petrochemical and allied industries in Odisha. Over a period of time, this will enable the State to increase its revenue and also create additional employment avenues for the youth of the State. It will also lay the foundation for a new industrial ecosystem, facilitating industrialisation and fiscal consolidation, he said. IndianOil had in 2004 signed a binding Memorandum of Understanding with the Government of Odisha whereby fiscal incentive was granted by the State Government to IndianOil for setting up Paradip Refinery. The fiscal incentive was in the nature of interest-free loan equivalent to the sales tax payable to the State of Odisha on sale of products during the first 11 years’ operation of the refinery from the date of commencement of commercial production. IndianOil commenced the construction of the refinery in March 2009 and started commercial operations in November 2015. After completion of the Refinery, the State Government decided to review the fiscal incentive and withdrew it citing reasons of delay in completion of the project, favourable economic conditions and increase in the size of the refinery from 9 to 15 million tonnes per annum. IndianOil approached the High Court of Odisha against the withdrawal of the fiscal incentive. The High Court granted a stay in favour of IndianOil and asked both the parties to settle the issue through the Joint Working Group constituted for the purpose under the Chairmanship of Secretary, Petroleum, and consisting of representatives of IndianOil and the State Government. Based on the discussions in the Working Group meeting held yesterday, IndianOil has accepted the advice of the Central Government for an amicable solution and the matter has been resolved in the interest and to the satisfaction of both the parties. As a result of the settlement, Odisha Government will receive regular VAT/GST revenue, estimated to be about Rs. 2,200 crore per annum currently, from IndianOil, out of which Rs. 700 crore per annum will be given as interest-free loan to IndianOil for 15 years.